As the holidays surround us, your schedule can get busier and life a little more hectic than usual. But it is during these times that we encourage you to remember the true reason for the season. We’ve created this 12 Days of Giving activity sheet as a reverse advent calendar for you and your family to do together. No matter if you are able to do one of these, check off a couple of them, or complete the whole thing – it is a guarantee that you will add a little brightness to someone’s day. 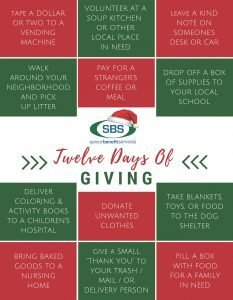 Download your printable – 12 DAYS OF GIVING – here! Thank you in advance for using these ideas to spread a little cheer!